click on that sweet announcement to make everyday a good one, full of cheap things and new adventures, right in your area. case in point: I almost purchased 2 circus acrobat lessons for only $49 yesterday. Unfortunately, I went home, ate too much food, watched intervention and then passed the eff out. 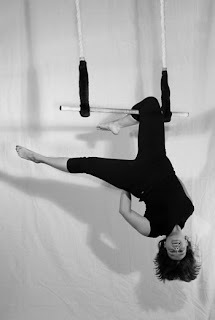 At 3am, I sat straight up in bed and gasped - i missed my chance to fly the trapeeeeze! ...hank is still trying to convince me to see a therapist. this could have been me. wah. I LOVE a good deal! Thank you. I love trapeze! I know a place...I took trapeze flying lessons last year...we can do it for your birthday. What do you think? Thanks for sharing this amazing place and it's beautiful info, It has been fun reading it. Keep sharing and caring. Best of luck for future blogs. and you thought i was crazy. ha! the daily mention - numero uno! pretty wishes and simple dreams. crying at work, the aftermath.